Longtime readers know that this has been a long hard road, creating a “market” for a patient voice to speak culture change at health conferences. This is an anniversary week worth noting, on several fronts … it’s the fifth birthday of not just my TED Talk, but two other events that bent my trajectory. 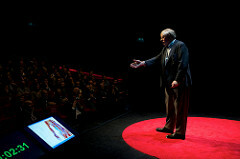 First, the TED Talk – I know you’ve seen it, but here it is anyway. Click it (to boost the view count:-)) or just skip ahead. Sixteen minutes later, the talk ended with the chant “Let Patients Help!” With a standing ovation happily in my tummy, I stepped off. Let patients help – we want to! 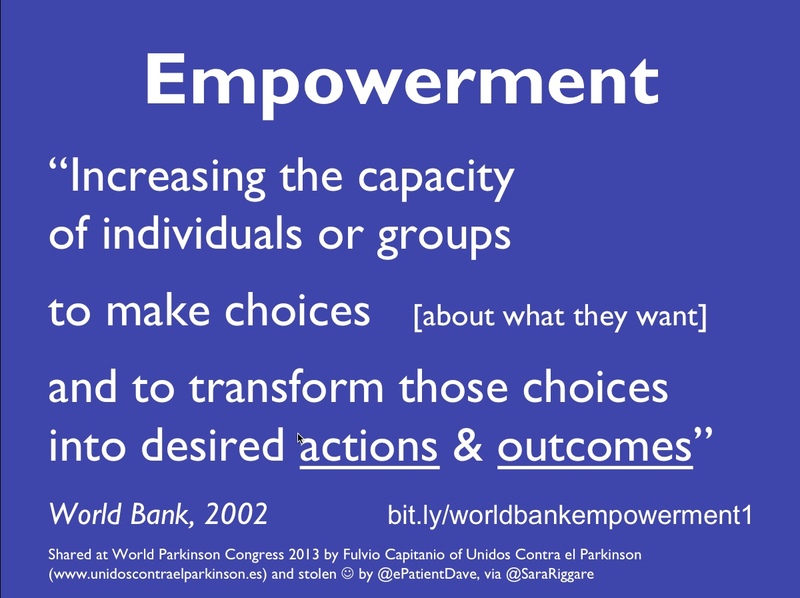 It’s time to adopt a good working definition of empowerment. A major theme of my work last year was that it’s time to create a science of patient engagement (see blog posts) – a rigorous inquiry into what patient engagement is, what factors (parameters) increase it, which ones diminish it, develop some hypotheses that researchers can test. This was the theme of my visit to the Mayo Clinic as Visiting Professor in Internal Medicine in March and my tenure as NEHI’s Patient Engagement Fellow. A science needs practical definitions. The Structure of Scientific Revolutions notes that until a field has an agreement on what a concept means, the practitioners in the field literally have nothing in common to talk about. I’ve seen that myself, when people talk about empowerment but the field goes nowhere. 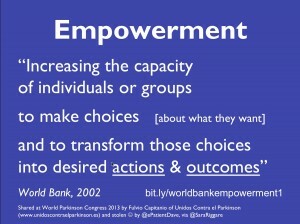 Fortunately, a useful definition of empowerment exists. 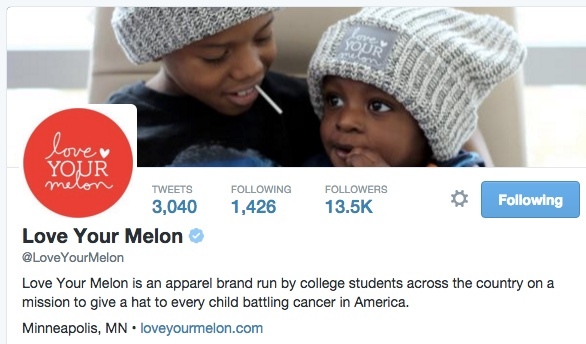 Buy one of the excellent quality hats from Love Your Melon – a college startup – and they’ll give one to a kid who has cancer. LOVE what they’re doing. 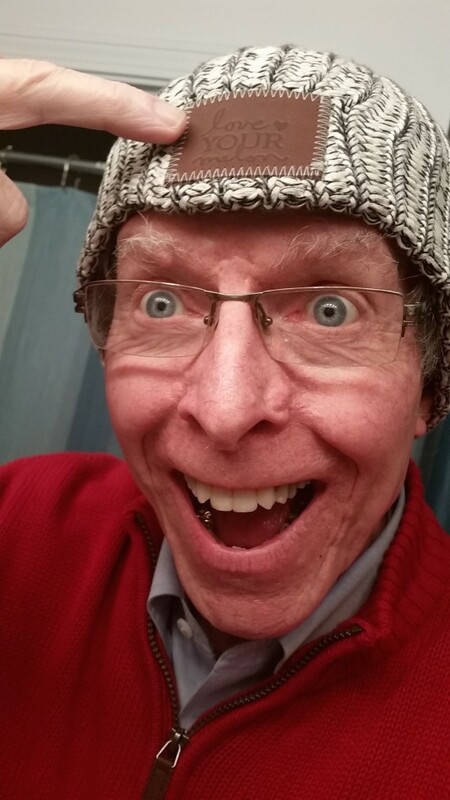 This is my first year ever as a seriously active outdoor person, as part of my diabetes prevention work, and this cap is now mandatory every time I go out in the cold. Seriously, I love this hat. Really well made, warm but breathable. I’ve never wanted a specific hat on my head when I go out, and this one I do. It’s so good, they sent me one for promotion, and I’m gonna buy it. I bought another one. One special request: When you buy, specify Grandview University as the referrer – they’re the ones who clued me in and hooked me up, so be sure they get credit. Thanks! Screw you, Facebook. And your ignorant “real names” policy. I’m outahere. Facebook has become a bunch of ignorant d*cks lately, and the missing letter is not “u.” I’ve had enough. I awoke Wednesday to find that my FB account had been locked out – I couldn’t sign in until I prove that I am who I say. Right: like who thinks I’m not actually what my Facebook page has always said, “e-Patient Dave” deBronkart? Then that night, talking to my wife, I discovered (see image) that my whole Facebook page has been taken down, until I stop this fraud and prove I’m really the guy who calls himself “e-Patient Dave”! Women’s Equality Day – 95th birthday of the 19th amendment. Remember and support! Click to go to the original blog post and DONATE! Honor our pioneers and be one yourself! Stand for what you stand for. 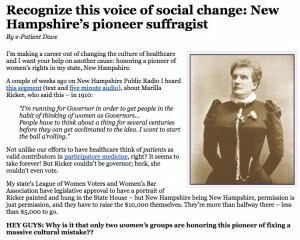 Remember my post the other day about Marilla Ricker, the New Hampshire woman who in 1910 tried to become governor? (Click the image or click here to go there.) The first well known suffragist in the state? We’re raising funds to have her portrait painted and hung in the State House, to honor this pioneer of new thinking. NOW, THEREFORE, BE IT RESOLVED, the Senate and House of Representatives of the United States of America in Congress assembled, that August 26 of each year is designated as “Women’s Equality Day,” and the President is authorized and requested to issue a proclamation annually in commemoration of that day in 1920, on which the women of America were first given the right to vote, and that day in 1970, on which a nationwide demonstration for women’s rights took place. We all know this social change is not complete, so let’s keep at it. Remember the work suffragists were doing 100 years ago and long before that. And please click and donate a few to remember Ms. Ricker. Study up at the National Women’s History Project, too.